Valentine's Day is just around the corner and it's time to think about all of those yummy cocktails that you want to enjoy. For me personally, I love fruity and sweet drinks but hubby likes his typically stiff & on the rocks. 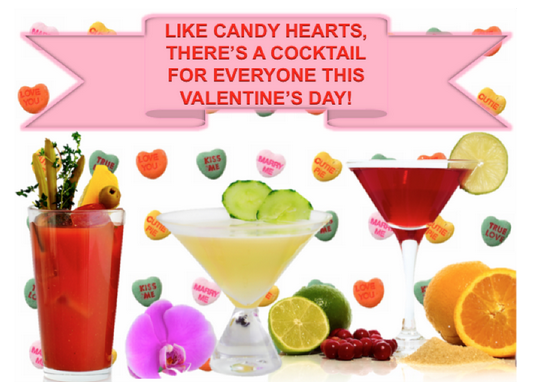 Here are some great Valentine's Day Cocktail Recipes to get you started. Gently shake. Strain into a pint glass filled with ice. Garnish with a lemon wedge and celery leaves. Muddle strawberry and gently shake. Strain all ingredients into a wine glass filled with ice and stop with a splash of soda and garnish with an orange wheel. Gently shake. Strain into a chilled martini glass and garnish with a lemon twist. My favorite is the Cosmo Berry Spritz cocktail, but depending upon my mood I might want one thatis sweet and sour or spicy and those recipes are here too.